Evan is a young Anishinaabe man who belongs to a small community in Northern Ontario. The North wasn’t always a part of their territory, but the community is working to make it their new home, and working to bring back the language and many of the traditional ways. When the community first loses internet and power, no one panics – this far north, it has happened before. But when it doesn’t come back on, and when they get word that the town to the south is experiencing the same conditions, the leaders have to decide how to respond, and what actions to take that would be best for the community. While Evan takes part in the discussions and decision-making, he is also thinking about his own family – his partner Nicole and their two young sons. Things get more serious when a stranger shows up from the south on a snow mobile and wants to join their community. It’s not their way to turn people away, but can they trust this stranger? Especially when people are alarmed about the future and looking for strong leadership? I found this book quietly gripping. It’s not action-packed, but the fate of the community is in peril and the thought process of many of the characters is compelling. Is the Chief a strong enough leader for this type of crisis? How will they decide to ensure the safety of the people? How will the people of the community react to the crisis, and to the arrival of the stranger? Survival had always been an integral part of their culture. It was their history. Something I appreciated about this book is that the author made sure to add details of daily life, including the changes that are made due to the internet and power failure. Without TV and internet as distraction, families spend more time together, preparing and eating meals, playing games and reading/telling stories. “The pace of their lives was slowing.” In addition, the daily ordinariness of their lives made the story seem that much more real – this imagined future scenario is all too possible. I didn’t want this story to end. After reading Moon of the Crusted Snow, I wanted more. I wanted to know how the community was going to live and survive. So, I picked up The Marrow Thieves knowing that the characters in this book are also trying to stay alive and thrive as a community. The two are very different books and stories, but they both start with a loss of power leading to chaos in the cities. They both take place in Northern Ontario, and both focus on a community of Indigenous characters (many of which are Anishinaabe) that have been driven north by the settler population (although the pace in The Marrow Thieves is faster, more desperate). I’d been intending to read The Marrow Thieves since it was a finalist in the Canada Reads competition this year. I would love to have seen this book win. However, it has been a national best seller for months, it won the Governor General’s Literary Award for young readers, the Kirkus Prize for Young Readers, and it has been optioned for a TV mini-series. I’m always wary going into YA books, even the ones that are raved about and win prizes. But this one is excellent and can be enjoyed by all ages. Another thing that kept me from picking it up sooner was its label as a dystopian novel. I was worried that the harvesting of bone marrow for dreams would be too implausible for me. (The panelists on Canada Reads certainly had me worried about it.) But the hunt for the bone marrow of the Indigenous is just the background, and not at all the point of the story. The Marrow Thieves tells the story of Indigenous people in this country in a new, exciting way. The focus is on the characters, their thoughts and ideas, and the way they work/laugh/cry/love together to form a transient community. The survival aspect of the story is also gripping… I was glued to the page. I thought about the sickness and the insanity that crept like bedbugs through families while they slept. What would I have done to save my parents and Mitch, given the chance? Would I have been able to trap a child, to do what, cut them into pieces? To boil them alive? I shuddered. I didn’t want to know what they did. And I didn’t really want to know if I’d be capable of doing it. I found it very satisfying to read The Marrow Thieves and Moon of the Crusted Snow back-to-back and highly recommend both (together or separately). *Thank you to ECW Press for sending me a copy of Moon of the Crusted Snow, which will be available in October. The first book sounds especially interesting. It is! And it’s something that could so easily happen in this crazy world. I loved the Marrow Thieves and now I can hardly wait to get the Moon of the crusted Snow. Great reviews. Thanks, Brian! If you liked The Marrow Thieves, I feel sure you’ll like “Moon”. Enjoy! I’m on the hold list for the Rice novel and eager to get into it. The fact that you didn’t want it to end makes me that much more eager! 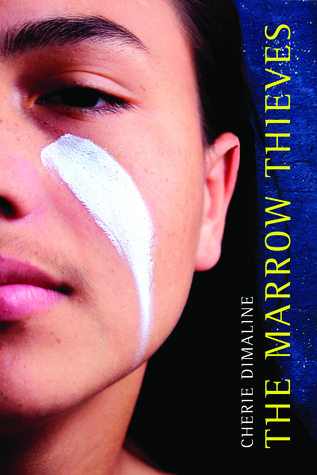 Yay: you read The Marrow Thieves! Now that you’ve had time to reflect on it, do you feel like the reservations expressed by the CR panelists were fair? Did that seem like it was such a key part of the story that it should have been referred to that many times during the debates? I felt like their “discussion” really did the book a disservice: there is SO much more to the story, especially the relationships (about which you can say little without spoilers, but aiyiyi, I was grinning at times and messily weeping at another point and grimacing many times along the way). No!! I can’t believe they spent so much time debating the “realism” of The Marrow Thieves. There is SO much more to it. I’m almost glad I didn’t read this before the debates – I would have been so angry! I’m interested in Moon of the Crusted Snow. I grew up in an Ojibwe reservation. Since I moved away 10 years ago, it’s a piece of culture that I really miss in my new location. They have Potawatomi here, but the tribe isn’t as involved in the city with culture and education centers as they were in my hometown. I hope you can get your hands on the book – I’d love to here what you think! I loved the dailiness of it, and the sense of community. It’s funny that you post this about these books today because, lat night, I watched a movie (based on a book, I think) Into The Forest about social breakdown after solar flares destroy the power grid, worldwide, and a Father and his two daughters have to learn to survive. It seems this kind of dystopian novel is back in vogue, or something. But I do like the sound of both the novels you highlight, more because they’re Canadian and about First Nations. I’ve added them to my list! Oh, I’m glad. I hope you like them! That movie sounds good. I just watched the trailer, and it also looks scary! Did you like it? The movie wasn’t scary, but it does have a couple of horrible moments that shock. That said, it’s mostly about the two sisters, how they deal with the situation and survive. It does pull at the heartstrings, and was very emotive. Well worth watching for the performances. I would love to see this movie: I heard about it but lost track of it (and I don’t think it was a mainstream release). It’s actually based on a 1996 novel, which I remember gulping in a single sitting,.Thanks for reminding me to go hunting for it! Now I want to read the book! Moon of the Crusted Snow sounds like a dystopian novel I could handle. I’ll add it to my list! It’s pretty tame as far as dystopian novels go. But still unsettling. Which I really like better than the action-packed stuff. Ooh, Moon of the Crusted Snow sounds particularly good. There is something about a lack of communication with the outside world that is particularly unsettling. Yes! I love books about being isolated, or feeling isolated, and the psychological effects of it. Thanks, Anne! Yes, trying to get back to real life. Once the kids are back in school, I’ll be set. Both sound intriguing but the first one especially. It’s not out over here yet but it looks like it’ll be published later in the year. I’ll keep an eye open for it! Must admit some days I kinda wish the internet would disappear… except for the book blogosphere, of course! It’s good to know it’s supposed to be coming out over there! I hope it does well. The Marrow Thieves has been on my radar for a while, but I’d never heard of Moon of the Crusted Snow. It sounds wonderful! That kind of not-exactly-dystopia, where you get to see the gradual breakdown of society-as-we-know-it, is my total jam. What a great match! I love set piece novels, ie set in a deliberately confined space. I share your reservations about ya but it’s good to find ones that get it right. Both of these are great – alone or together! I’m not a huge fan of post-apocalyptic fiction, but both of these sound excellent, the first one in particular. I’ll keep an eye out for its UK publication. Thanks for getting me to read more widely Naomi! 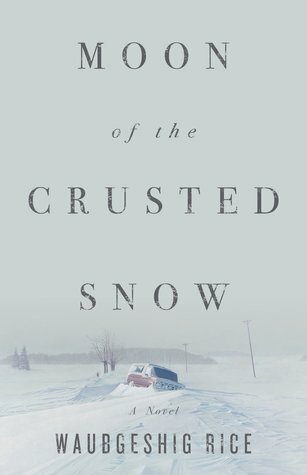 Moon of the Crusted snow is perfect for you if you’re not a big fan of post-apocalyptic fiction. It’s quiet and subtle, and it could happen tomorrow.